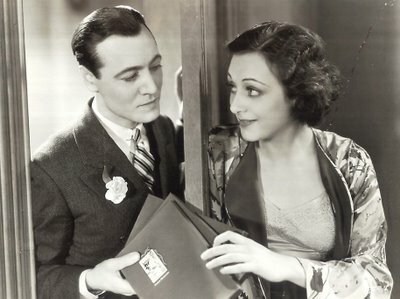 As if to confirm for all time that life isn’t fair, we have the career of Ann Dvorak. 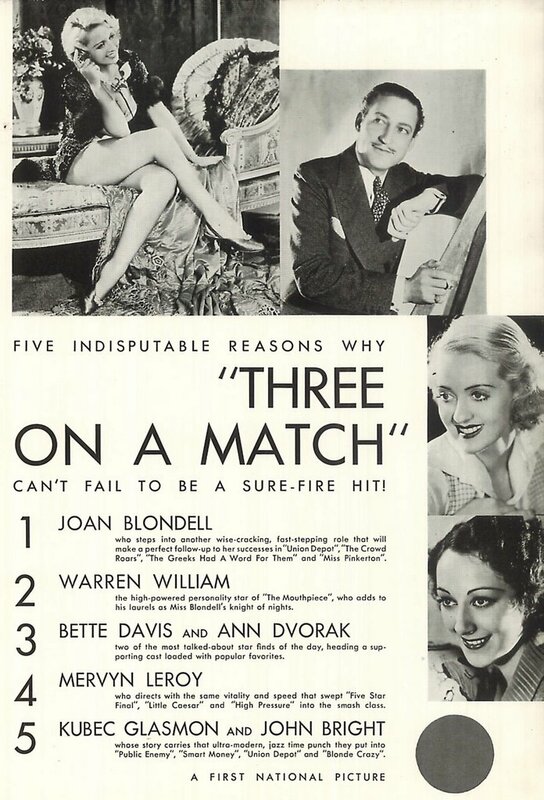 She should have been everything Bette Davis eventually was, and if her performances in Scarface, The Strange Love Of Molly Louvain, and Three On A Match are any indication --- probably a good deal more. Compare the two of them together in the latter, or two years later in Housewife. Dvorak’s younger than Davis, but a more seasoned actress. Bette could never sing or dance. Her rival could. Most importantly (to male viewers), Davis was not hot. Dvorak was smokin’ hot (well, see for yourself!). 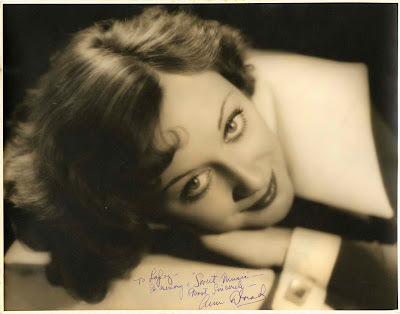 Were it not for a precipitous walk-out on her Warners contract, Ann Dvorak would have certainly become one of the screen’s most celebrated distaff stars. Just being good isn’t always enough, however. Perseverance and judgment count for at least as much. Davis had these, plus the talent. Her dedication to the career excluded all else, and she got immortality for her trouble, while Dvorak opted for husbands, war work, and early retirement. 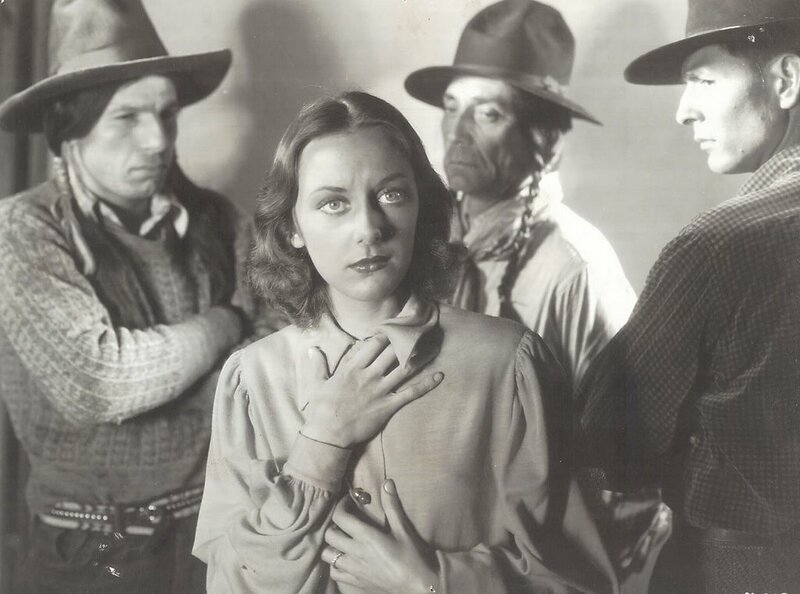 Chances are that in the end, it didn’t matter so much to her, but what a shame she couldn’t live long enough to enjoy the Pre-Code Goddess laurels that would surely (and deservedly) be heaped upon her by fans today. Dvorak’s father had been an actor and director at Biograph. Her mother was in the biz as well. By the time she’d reached fifteen, Ann had left school and was supporting the family, Dad having powdered out some time before. Nightclub specialties were a teen-age occupation, followed by assistant dance director status at MGM before she was seventeen. Glimpsed among the chorus in a number of early musicals, she’s seen here fourth from the left behind the lead dancer in 1930's Good News. Very much a graduate from the school of life by the time Howard Hawks noticed her on the floor with George Raft (dancing, that is, and torridly), her casting in Scarface and an affair with the master director were all but a foregone conclusion. You can marvel at the maturity of her performance on the one hand (here with Paul Muni), but I suspect Dvorak was more than conditioned by experience to play these very adult roles while still in her teens. 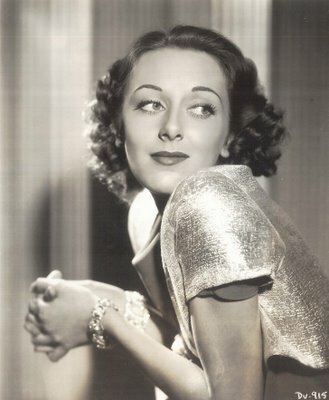 A comparison between this woman and any number of modern-day counterparts still impersonating ingenues and gamines in their thirties is quite a startling revelation for those who still imagine that movies, and actresses in them, have acquired greater sophistication since the thirties. For Scarface and a follow-up war comedy, Sky Devils (shown here with Spencer Tracy), Howard Hughes paid Dvorak $250 a week, then sold her contract to an anxious Warner Bros., who put her immediately into a showcase lead, The Strange Love Of Molly Louvain. 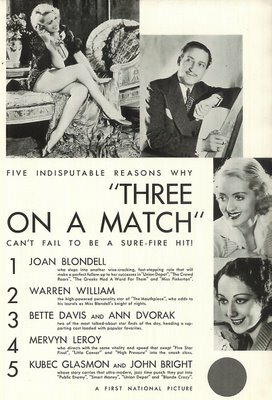 Worthwhile parts were hit or miss afterward, and the salary remained at $250, but Dvorak’s lot was no worse than any other untried actress on the lot. Impatience and a confrontational nature were encouraged by a new husband, Leslie Fenton, an older British actor who made no disguise of his contempt for Hollywood and its varied perfidies (that’s Fenton pushing against her door in Molly Louvain). His manipulation resulted in a unilateral parting of ways, the announcement of which was tendered to Warner bosses by way of a perfunctory telegram dispatched just as Dvorak and Fenton prepared to sail for Europe. That was July 4, 1932, and maybe this was her idea of declaring independence, but it came way too soon for any kind of sympathetic response from fans or the press (unlike Davis’ similar walkout later in the decade). Dvorak took the ocean voyage, but it was her career that was sailing away. It’s a tribute to Dvorak’s talent that Warners would even let her back in after such a display of effrontery, but perhaps they felt revenge would best be served on site, for the work that followed their so-called reconciliation was clearly beneath her (including a turn as an Indian in Massacre, shown here). Her period of compliance was brief --- by February 1936 she was back in court, determined to get a release. 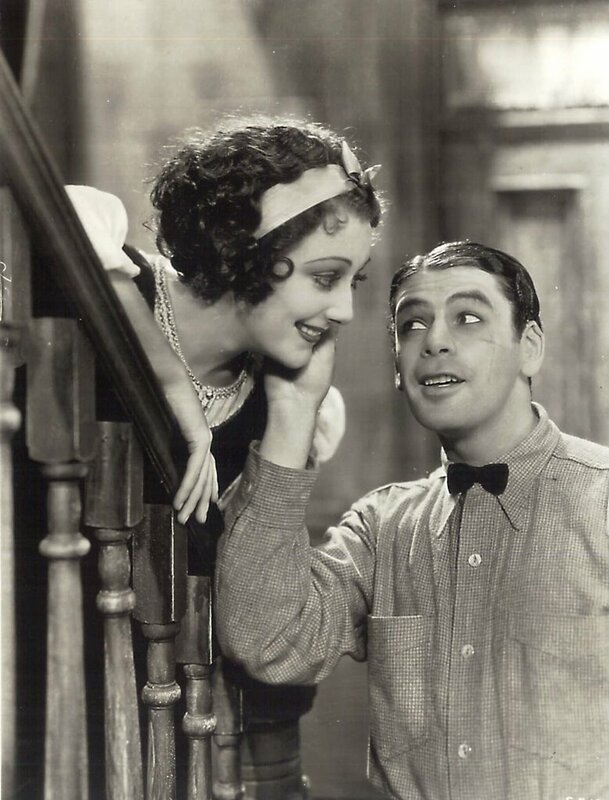 A year’s wrangling was more likely inspired by Warner’s effort not to be shown up by a contract artist, for within twelve months, Ann Dvorak was indeed set free. Her victory would be a hollow one, for she’d soon become a card game casualty --- one of those recalcitrant ingrates moguls liked to smear as they tossed chips into thousand dollar pots. This sort of informal blacklisting would slam the door on whatever prospects Dvorak might entertain for a screen comeback. 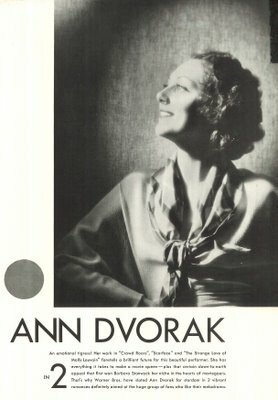 She wound up on call sheets at Columbia and Republic (guess Cohn and Yates never sat in on those high-stakes games), then finally quit the US altogether in 1940 for an extended stay in England and admirable contributions to their defense effort (she drove ambulances during the height of the Blitz). By the time she returned four years later, there’d been a split with Fenton and new determination to get her momentum back. She was only 32, but seemed older to those who remembered the powerhouse thesping from nearly a generation before. Dvorak was just too far past her peak to ever imagine she’d scale it again. 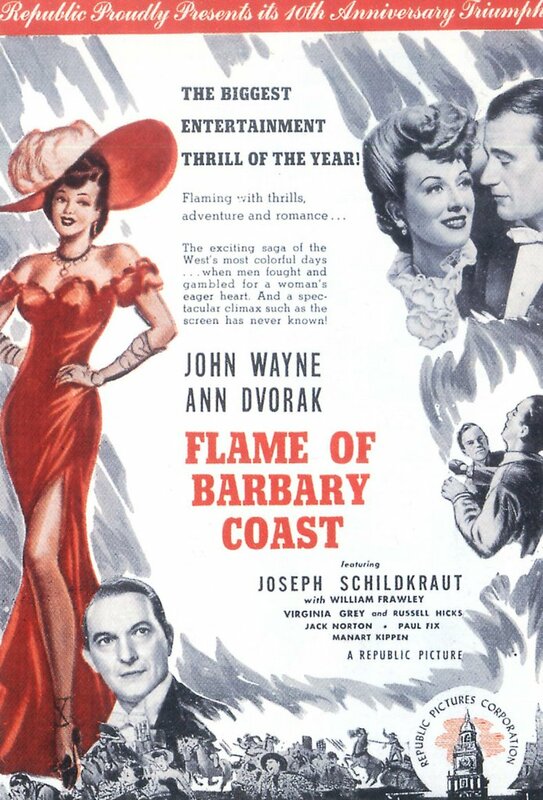 Leading lady position in Republic’s tenth anniversary special, Flame Of Barbary Coast, may have seemed a mixed blessing, but this $600,000 splurge for the normally frugal company was at least an opportunity for Dvorak to put across a full plate of songs amidst reasonably lush period settings (Frisco just before, and during, the quake). 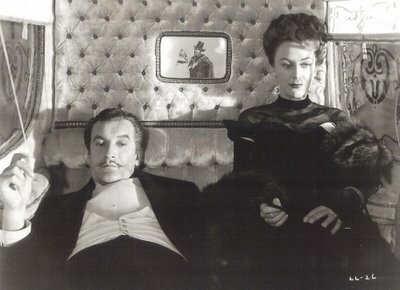 She’s way too good for what amounted to a "B" western in neater attire, and the exposure didn’t necessarily lead to better things, unless you considered indies released through United Artists and Eagle-Lion a step up (here she is with George Sanders in one of them, The Private Affairs Of Bel-Ami). All of her work in these was fine, but the majors were still more or less shunning her. It would be 1950 before she’d get to demonstrate the old fire in an otherwise weak Lana Turner vehicle, A Life Of Her Own, wherein Dvorak played a suicidal washed-up fashion model who jumps out a window during the first act and pretty much takes the picture with her. A couple of years later, Dvorak would herself bail on the industry --- not even forty, but wise enough to realize it was over. She’d married again (and again), but never returned to performing. Dvorak became, of all things, an avid collector of rare first editions. Like a lot of self-educated people, she was, as she put it, a fanatical reader, as well as a devotee of language studies (funny how so many folks with degrees and diplomas never again pick up a book once they’ve completed their "formal" education). She lived under the radar for several more decades, and so far as I know, never sat for an interview. Ann Dvorak had been residing in Hawaii when she died in 1979. Ann Dvorak is one of those indelible memories of my childhood even though I only saw her in such dreck as "Cafe Hostess." There was something elctric about her. Your comment that "Being good isn't always enough . .judgement (counts) for at least as much . ." reminds me so much of Frances Farmer. I thought Ann was especially poignant in "Our Very Own." I have always wondered about her, since I was 14 or 15 when she died, and I read a sad article about her that was published after she died, in either the National Enquirer or the Star. I don't know how true it was, but apparently though she resided in Hawaii, where she lived was very much the opposite of an affluent neighborhood. None of her neighbors knew they had a film star living amongst them. As I recall, she died of stomach cancer. 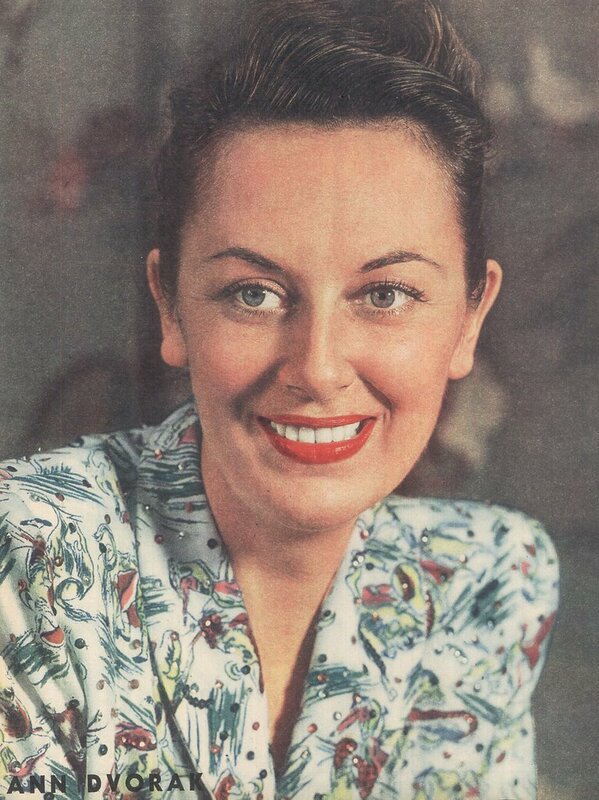 For years, the only thing I knew her for was a reference in a Lenny Bruce routine, when he gives the credits of a movie -- "...And Ann Dvorak as the woman across the bay." Then I saw "Scarface" -- hot is too mild a word for her. I always wondered why her career didn't pan out.